Located in the quiet and private "Isola delle Rose" at about 20 minutes from Venice, the most famous lagoon, the luxury JW Marriott Venice Resort & Spa is the perfect choice for your romantic and exclusive holiday in Venice. This pretty islet in the San Marco Lagoon is a serene retreat from the bustling central islands and thanks to the complimentary shuttle service, you can easily reach Piazza San Marco and all the most interesting places of Venice. The international airport Marco Polo is 50 minutes’cruise away. 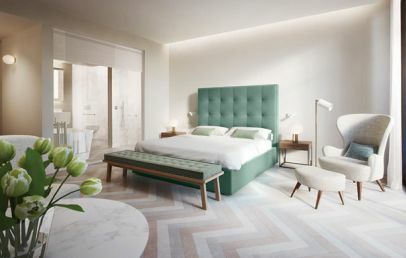 JW Marriott Venice Resort & Spa is a 5-star luxury hotel able to reflects the beauty and harmony of the surroundings and offers a luxury atmosphere thanks to the refined and contemporary interior design by Matteo Thun. The resort houses 250 rooms and suites furnished with care and modern comforts and characterized by an enchanting view of the greenery and Venice. 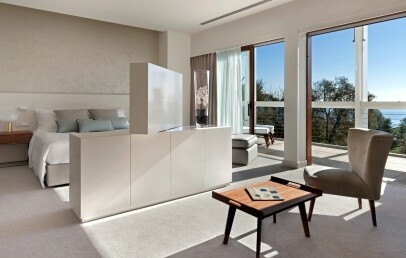 All room typologies feature individual heat and air conditioning control, windows, separate bathtub and shower, minibar and coffee machine, wired and wireless internet connection, complimentary Wi-Fi in the Studio Suites, Premium Suites, Uliveto Suites, Maisonette & Residenza Suites and Villa Rose, 42" flat screen TV and alarm clock. At guest disposal is a shuttle boat service and useful information provided from the staff to enjoy the pleasantly and fascinating atmosphere of Venice. 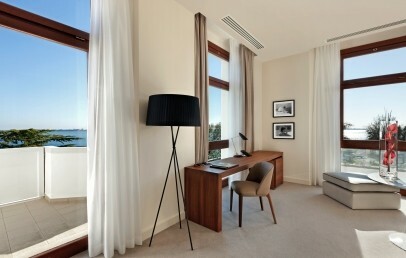 The JW Marriott Venice provides diversified activities. Furthermore the hotel offers guided wellness & walks in the park, jogging, badminton as well as various type of cooking classes (extra fee). Tourist tax – The city of Venice requires the payment of a tourist tax per person/night to be paid on spot. An elegant 2 Bedroom Villa with two bedrooms with walk-in closet, a separate dining room and a separate living room. Each bedroom has a king size bed. The Villa offers 3 bathrooms with tub/shower, hairdryer, make-up mirror. The maximum occupancy is 6 people and with the possibility to add a crib. The Villa offers all kind of modern amenities such as: individual heat and air conditioning control, coffee and tea facilities, high speed internet connection and Wi-Fi (surcharge), 3 TVs 42" flat screen with cable and satellite channels and pay-per-view, evening turndown service, safe (surcharge), non-smoking Villa. The view goes over Venice. 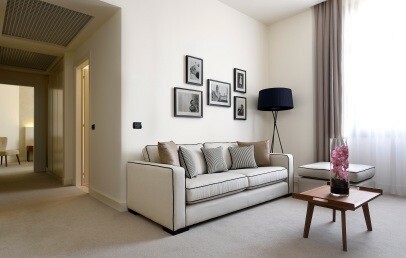 Elegant and large double rooms ranging between 36 to 46 sqm. They provide individual heat and air conditioning control, windows, minibar and coffee machine, wired and wireless internet connection (surcharge), 42" flat screen TV and alarm clock. 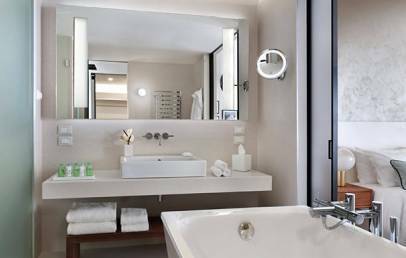 The en-suite bathroom features separate bathtub and shower. The De Luxe rooms have a gorgeous views of the luxuriant vegetation of the island. Elegant and large double rooms ranging between 47 to 5 sqm surface. They provide individual heat and air conditioning control, windows, minibar and coffee and tea facilities, wired and wireless internet connection (surcharge), 42" flat screen TV and alarm clock. 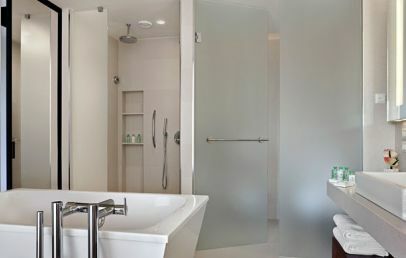 The en-suite bathroom features separate bathtub and shower. 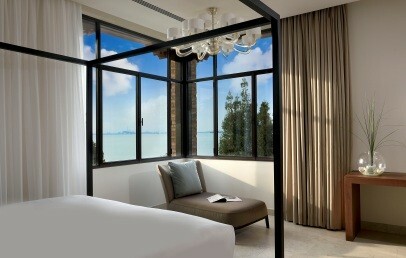 The Junior Suites face the stunning landscaping of the island. 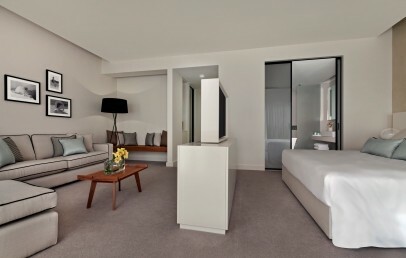 An elegant and modern Suite with a king size bed and a separate living area with sofa, chair and desk. They offer all modern comforts as high speed internet connection and Wi-Fi (surcharge), air conditioning, 2 TV’s with cable/satellite channels and pay-per-view, coffee maker and tea service, hairdryer, iron and ironing board. 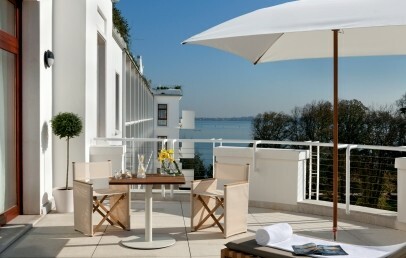 The Suite offer either view on the garden or on Venice. 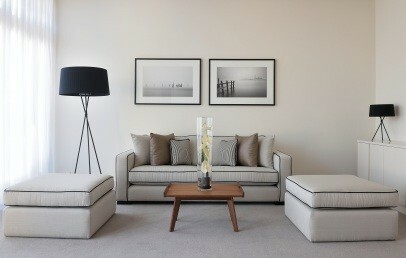 The Studio Suite can accommodate up to maximum 3 people. 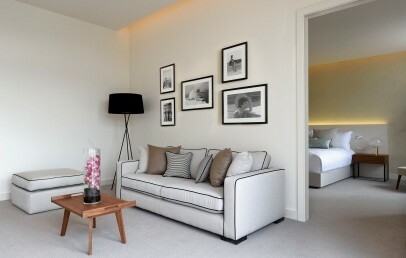 An elegant and modern Suite with a king size bed and a separate living area with sofa, chair and desk. They offer all modern comforts as high speed internet connection and Wi-Fi (surcharge), air conditioning, 2 TV’s with cable/satellite channels and pay-per-view, coffee maker and tea service, hairdryer, iron and ironing board. 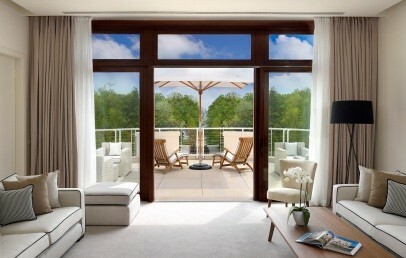 The Premium Suite offer a balcony / terrace with view either on the garden or on the Lagoon. 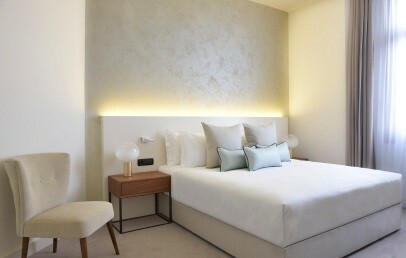 The rooms are spacious and fulfilled with light, furnished in a contemporary style with soft colors. La Residenza De Luxe has a night zone and a living zone, that opens up to the private garden patio. Wired and wireless internet connection (with costs). 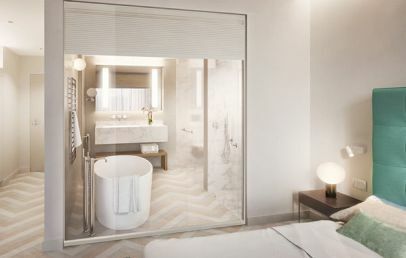 A transparent wall divides the bedroom from the bathroom, that offers a shower and a separate tub. 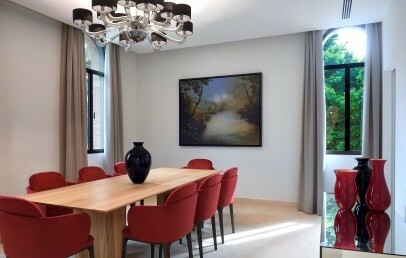 This rooms reflect the beauty of Venice, characterized by water and light. 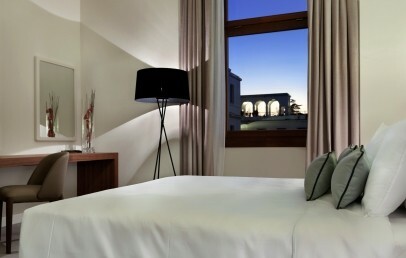 The Venice Pool Deluxe rooms are harmoniously orientated in direction of the beautiful lagoon. Each room has a bathroom with shower and separate tub and a sleeping area, which expands on the great dock-terrace with a built-in private pool. Wired and wireless internet connection (with costs). 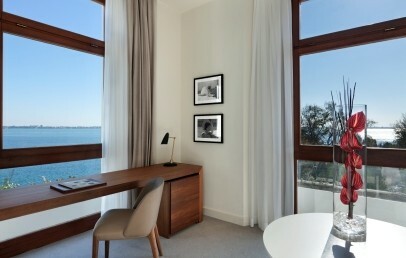 Each unit of the Suite is filled with light and overlooks the beautiful lagoon with views of Piazza San Marco. It offers a comfortable living room with dining area, a bedroom and a bathroom with tub and separate shower. 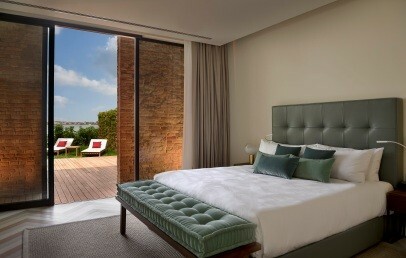 On the other side of the sliding glass door, there is the wide wooden terrace with a large private pool. 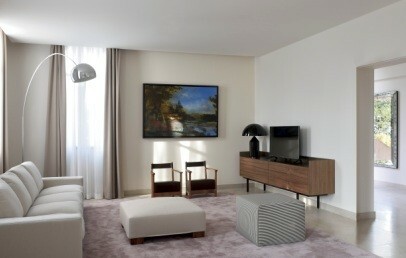 This Suite is also well-suited for a family holiday. Wired and wireless internet connection (with costs).